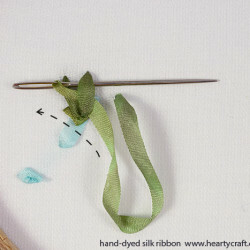 This way of fastening off is good only for narrow silk ribbons (2mm and 4mm width). 1. Using a blunt tip of your needle, where the eye is, pass it under the previous stitch on the back of the fabric, leaving a loop. 2. Then bring the needle through the loop. 3. Tighten the loop very gently, pressing the stitches on the back with your finger while pulling in order not to ruin them on the front. 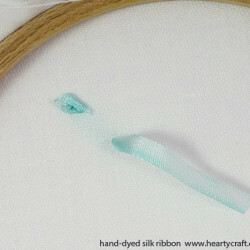 The method is perfect for 2mm, 4mm, and 7mm wide ribbon. 1. 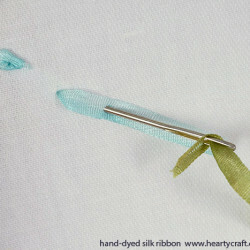 When you want to change a colour or a ribbon, leave the ribbon tail dangling free at the back. 2. 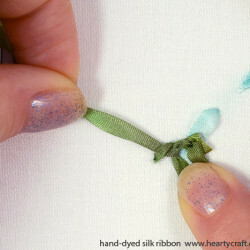 Thread a needle with a new ribbon, and knot it with a regular or a soft knot. Then whilst making a stitch with the new ribbon, piece the free ribbon end, so it securely pinned to the back of the fabric. 3. 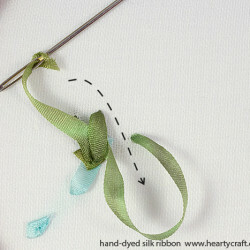 Clip the tail short and carry on stitching with the new ribbon. 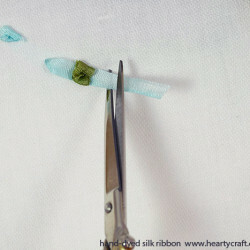 Whether the method you prefer, do not be put aback by using knots in silk ribbon embroidery. 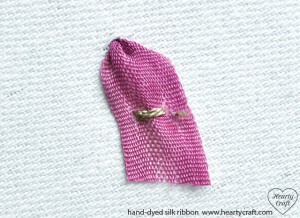 As you know, it is not recommended to stitch with knots in traditional techniques when you stitch with floss, like, for example, in crewel embroidery, silk shading, stumpwork, blackwork, and so on. It is absolutely fine to use knots when stitching with ribbons, as here you usually have two layers of fabric supporting stitches. Moreover, silk ribbon embroidery pieces tend to have rich texture, so tiny knots here and there do not add any discernible bumps to your embroidery on the front. So relax and enjoy! If you like our projects, why not to sign up for our fortnightly newsletter and keep up with the news, tutorials, and patterns for ribbon embroidery? To sign up, just type in your email address into the form on the top of the page. I learnt ribbon embroidery recently in Tanzania. Now back in the UK I find it very hard to get the ribbons I need so any advice would be appreciated! Haven’t come across many tutorials like this so am very interested in seeing more.